We Bare Bears is a Cartoon Network show about three bear brothers living in the San Francisco Bay Area. Jordan Peele’s Get Out is horror/comedy thriller about an unsuspecting black man who wanders into a trap set by nefarious white people. What could these two things possibly have in common? 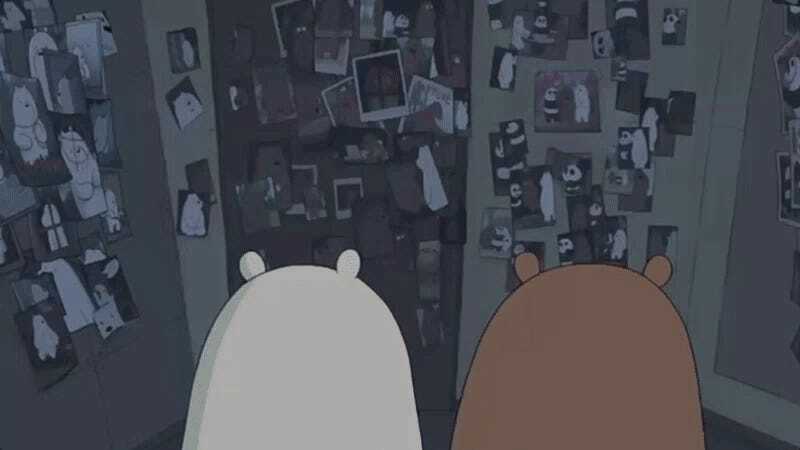 Turns out, not all that much usually, but one particular episode of We Bare Bears shares a sizable amount of narrative and aesthetic DNA with Peele’s film. Over the weekend, I caught a rerun of “Neighbors,” the 26th episode of We Bare Bears’ second season, in which a couple of pleasant-enough humans named Faye and Warren move in next door to the Bears’ cave in the woods. While Panda and Ice Bear are more than charmed by their new neighbors’ friendliness, Grizz can’t quite shake the feeling that something is off about the pair. Their professed fondness for bears, for example, sets Grizz’s teeth on edge despite his brothers’ insistence that Faye and Warren are totally harmless. Slowly, Faye and Warren begin to ingratiate themselves to the Bears while doing and saying things that, to anyone who’s seen Get Out—or, like, been a person of color accosted by an overly-friendly white person—would recognize as a red flag. Always be on the lookout for polite white women wielding teacups. In one particular scene, Warren sizes Grizz’s body up before inspecting him with his hands while asking comments about the bear’s fur and strength. The moment echoes a scene in Get Out where Chris (Daniel Kaluuya) is unknowingly being appraised by a group of people who are secretly about to place bids on his body at a silent auction. As Grizz’ suspicion about the humans continues to mount, he and the other Bears begin to notice them acting strangely near their homes and doing things like waking up in the middle of the night to chop wood. “Neighbors” culminates in an odd twist that recontextualizes everything leading up to the ending, but the episode closes on a slightly off-note that brushes up against one of the more basic ideas that Get Out played with so cleverly: always assume the worst when a new acquaintance openly treats you like an object as opposed to a person.